Last August, my 6-year-old son, who’s in Kinder 2 class, took home a long white sheet of paper that he had to accomplish. It had the title “K2 Ranger 2013 Individual Write-up.” He had to complete this sentence: “My most memorable day in kinder two was when…” and he had to interpret what he wrote by way of a drawing. 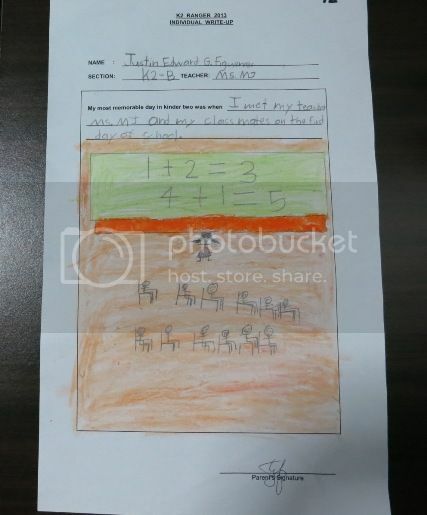 This was what he wrote: “My most memorable day in kinder two was when I met my teacher Ms. MJ and my classmates on the first day of school.” He drew stick figures of his teacher and his classmates inside their classroom. The addition problems on the blackboard are Ms. MJ’s lessons for the day. He had to redo his first two write-ups because he used dark colors in them and we couldn’t see his drawing anymore. I told him to use light colors instead so we could still distinguish his teacher, his classmates and their classroom in his drawing. This write-up will be included in the K2 yearbook for the school year 2012-2013. We both liked the end product. It’s neat and clean. In my haste to take a picture of his finished product, I actually forgot to do online research about baby take me home outfits that a dear friend requested. Oh well, when mommy duty beckons, all else is forgotten. This entry was posted in Kinder 2, Yearbook, Yearbook Write-up. Bookmark the permalink. our kids are growing up really fast!! 🙂 see you around Tetcha! Your boy’s work is so neat. Good job! ← Robinsons Supermarket (Robinsons Galleria) Goes Green!